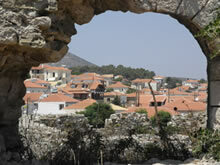 In antiquity Methoni was known by the name Pedasos. Homer mentions it as one of the seven cities that Agamemnon offered to Achilles to appease and persuade him to reimburse the battle (Iliad, I, 149-153). Pausanias (Messinian IV, 35, 1) and Strabo (Geography 8 359-360) called it Mothoni and identified with the Homeric city. Characteristic is mention of Thucydides for sick fortified city walls in the 5th century, the form and extent of which remains unknown until today. In Roman times the city became autonomous of the Emperor Trajan and enhanced with better fortifications. Pausanias mentions as being the temple of Athena Anemotidos and sanctuary of Artemis, and the city saved coins depicting the harbor. 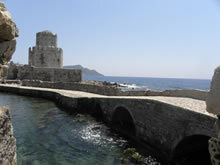 In the early Christian period the port of Methoni flourished as a commercial center and refueling station for ships. During the Middle Byzantine period a series of stamps dating from the 9th to the 13th century give us information for government and church services in the city. The Venetians first appear in the historical scene during the 11th century, when they have privileges on the free movement of goods in various port cities of the Byzantine Empire, including Methoni. With the fall of the Byzantine Empire by the Franks in 1204 (DStafroforia) and Methoni will test their dominance. The Frankish period will last until 1206, when Methoni was occupied by the Venetians and by a treaty signed in 1209 ensured their dominance in the city. During the first period of Venetian life in Methoni organized according to the interests of Venice. The city was fortified and developed into an important commercial center since defined as obligatory stop for all Venetian ships traveling to the Eastern Mediterranean. That thriving season for Methoni, ended in August of the year 1500 when, after bloody siege, conquered by the Ottomans. The first period of Ottoman rule would last until 1686 when the city was besieged by Morosini and returned to the possession of the Venetians. The 1715 The Ottomans made for the second time holders of Methoni, whose population increased and commercial traffic in the harbor. During the Greek Revolution the castle of Methoni not captured by the Greek rebels, despite repeated efforts had paid, due to the resistance of the fortified Ottoman population. In 1825 he landed in the port city Ibrahim and settled inside the castle, which became the base of operations Egyptians during their campaign in the Peloponnese. The Egyptians would surrender without a fight in 1828 at the French expeditionary force led by General Maison. The settlement was then transported outside the walls, is the street plan of the city and the castle that for centuries was the center of social and economic life of the town is deserted. The harbor and the castle of Methoni have for centuries been an important geopolitical hub for their respective holders, for economic trade and transportation for the travelers in the Mediterranean and the pilgrims to the Holy Land. 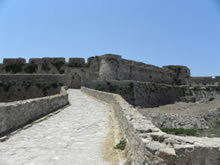 The Castle of Methoni – area of ​​about 93 acres – consists of two parts. To the south lies the city, surrounded by simple walls with towers at regular intervals while the northern part, which is reinforced defensively as it is the most vulnerable, developed the town’s fortress, home of the occasional military commander. The two sections are separated by an intermediate low wall reinforced with five towers. The walls of the fortress protected by a wide moat and supported by two ramparts that dominate the north side of the castle. In the middle of the same side opens the main entrance gate is made of rectangular ashlar limestone and has elaborate decoration of the pilasters. The castle has six more gates, three of which are on the harbor side. Most of the doors opened on the ground floor tower and protected by katafrages and gun-loops. The castle walls made of rough hewn stones with strong bonding plaster have battlements which are accessible from the devil which is accessible from inside the two parts of the castle. The walls were reinforced at intervals with towers, most of which are preserved at very low altitude. Depending on your needs and the development of military architecture to address the new requirements of the martial art, the walls were reinforced or rebuilt. 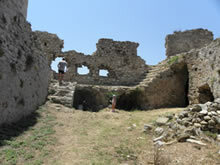 Within the castle kept various structures. In the central part, known as the “Square of Weapons” is the I.V. Transfiguration, single-spaced wooden roofed temple probably built during the Venetian period. Vicinity of and in contact with the western wall is small square building with a pyramidal cover which used as a gunpowder and dates during the first Venetian period. Along the main corridor of the castle survived two Ottoman baths consisting of several vaulted rooms, each of which had different uses (locker room, lukewarm room, and warm room). Dating back to the first period of Ottoman rule. Within walking distance is maintained the base of the minaret of a mosque damaged now. The mosque was built on the site of a basilica, the exterior walls of which were reinforced with buttresses. Perhaps it is the church of St. John the Theologian. 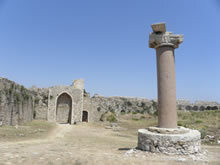 Architectural feature of Methoni is Mpoyrtzi, epithalassio small fort, built on a small island in the south of the castle. Consists of an octagonal tower, which is surrounded by a low octagonal wall. The tower is built on two levels and is covered with a semicircular dome. The ground floor occupies a quadrangular cistern. Ramp leads both transepts of the perimeter wall and the upper floor of the tower, which formed room with cannon around. The interior walls are distinguished beam cases relying four wooden floors, now destroyed.The construction of the fort began shortly before 1500 by the Venetians and completed by the Ottomans in the 16th century. Mpoyrtzi was part of the maritime fortress of Methoni and served several purposes through time: used as the headquarters of the garrison to control the port, as a beacon, jail, and shelter residents in times of siege.